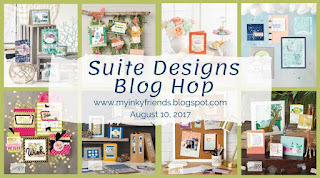 My Inky Friends have a bit of a different twist to our hop this time - instead of choosing just a stamp set and/or matching dies, we are featuring entire suites! 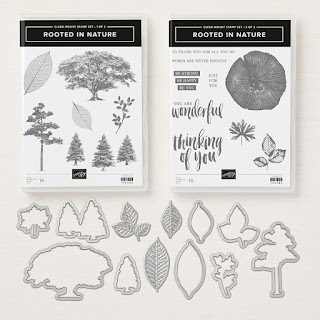 That means DSP, embellishments, embossing folders, and any other bits that are part of a suite that go along with the stamps, dies, or punches. There are ten of us this go-round, and you may have landed here from Holly's blog, where she showcased Garden Impressions. Wasn't it great?! To see the whole blog roll, click the banner above or just follow the links to see all the sweet suites! I chose the Nature's Poem Suite because it is so versatile and has many fun elements to work with. 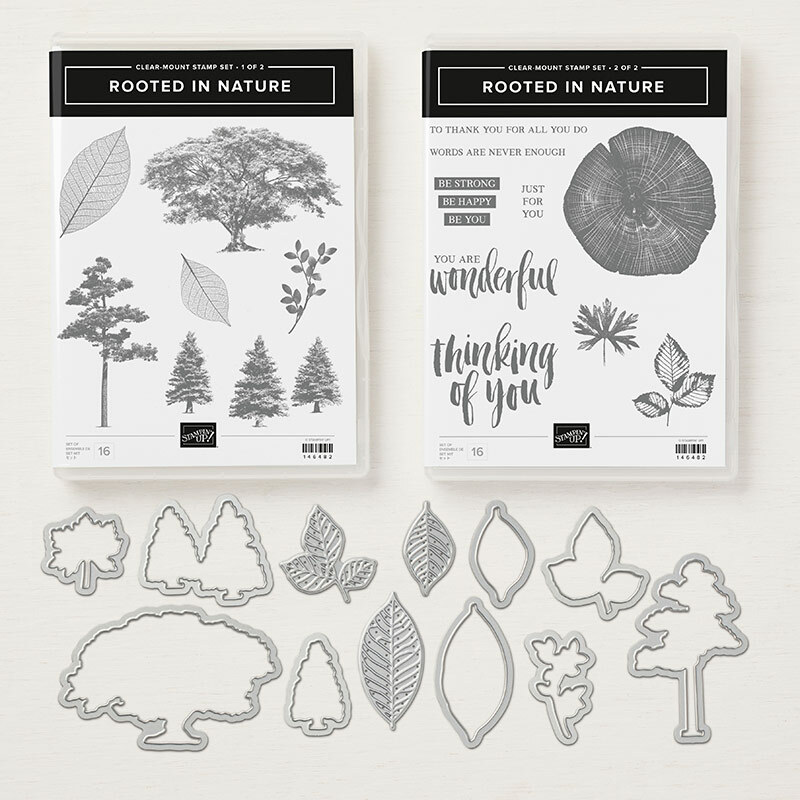 The suite consists of the Rooted in Nature stamp set, Nature's Roots Framelits Dies, Nature's Poem DSP, Nature's Twine (4 colors in the pack! ), and Leaves Trinkets. If you get the stamp set and die bundle, you can save 10% AND this month you'll get a Bonus Days coupon, too! For my fist card, I chose the greens that are in the Nature's Poem DSP pack, Mint Macaron and Tranquil Tide. 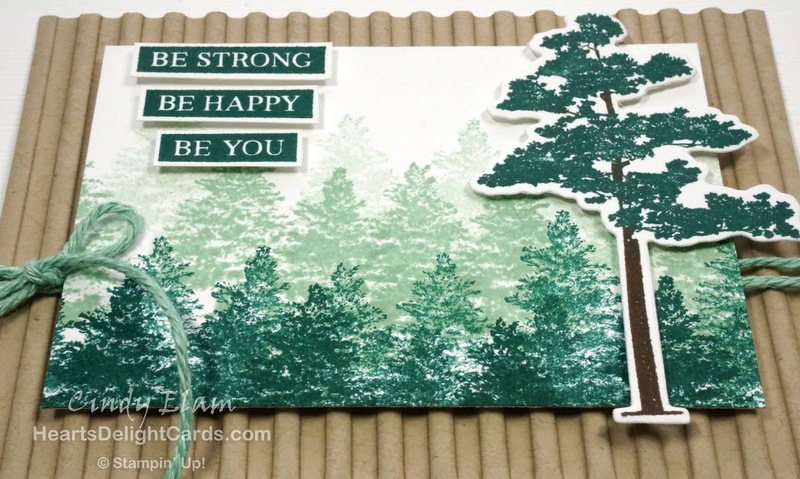 The evergreens were stamped and stamped again without re-inking to give the appearance of trees in the mist. I thought thought the greeting was perfect - saying, in effect, to stand out in a forest of sameness. Since this suite doesn't have an embossing folder, I used the Subtle Dynamic TIEF, plus I'm giving you a sneak peek at the Corrugated Dynamic TIEF that's coming in the Holiday catalog next month! WOOT, I do love me some texture!!! 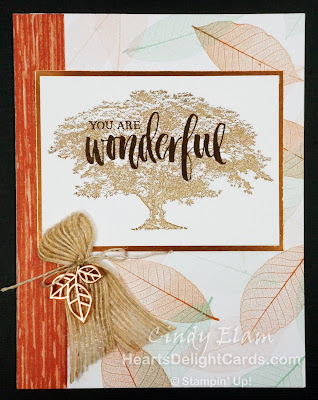 My next card uses some of the DSP, as well as one of the Leaves Trinkets. I love how the metal element plays off the earthy burlap ribbon. 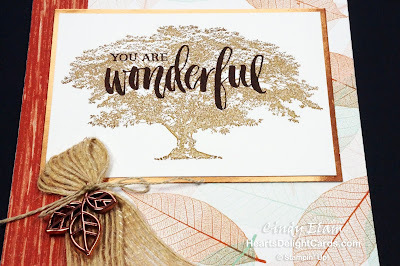 The tree was inked in Soft Suede then stamped off once to lighten it. 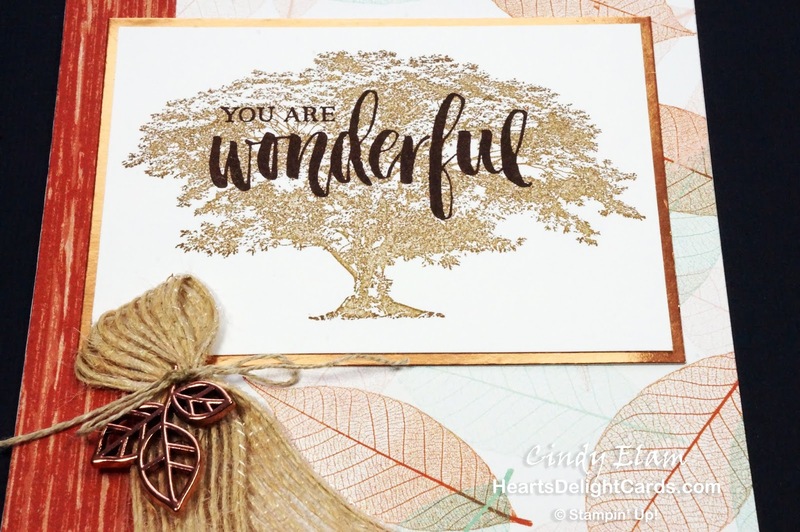 I just wanted it as a background for the greeting, not the main focal point like this card. The image panel was matted on Copper Foil to coordinate with the copper leaf element. There you have it - the awesome Nature's Poem Suite, which can be found on pages 142-144 of the 2018 annual catalog! Now hop on over to see what Tanya has for you. 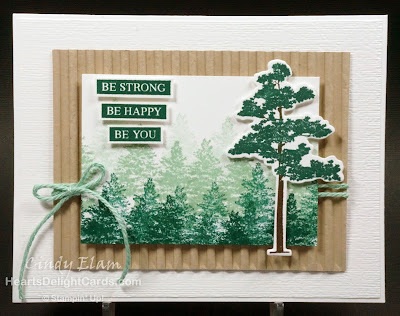 She's featuring Tranquil Textures, and I KNOW she's going to rock it (and make me want to buy it)!